Friday 9:00 a.m. to 3:30 p.m. – NEVADA STATE CAPITOL LEGISLATIVE PARK, Carson City, NV. 100M packet pick-up, pre-race med checks and drop bag collection is MANDATORY as there is NO RACE-DAY CHECK-IN. 3:30 p.m. to 4:30 p.m. – NEVADA STATE CAPITOL GROUNDS. The “MANDATORY” 100M race briefing will begin at 3:30 p.m. in the Legislative Park next to packet pickup. It is highly recommended for pacers to attend this briefing but not mandatory. Runners are responsible to ensure their pacers are aware of all competition rules. 100-MILE RUNNER DROP BAGS: Drop bags are allowed at Hobart, Tunnel Creek, Stonehenge 50 Mile and Diamond Peak. Drop bags for Hobart Aid Station are due at the drop off point at Packet Pick-up no later than 3:00 pm on Friday. Tunnel Creek and Diamond Peak Drop Bags may be dropped off on Friday at Packet Pick-up or Saturday morning, although it is recommended that they be dropped off on Friday. All Finish Line drop bags should be taken to the Ultra Lounge area on race morning. (finish line area is separate from the Stonehenge 50 Mile aid station. Do not leave these bags at the 50 Mile aid station). DROP BAG RETURN: Please be aware that drop bags will not be returned until Sunday at approximately 10:00 am from Diamond Peak and approximately 3:00 pm from Tunnel Creek. Any unclaimed 100M drop bags will also be available at the awards ceremony on Sunday afternoon. Plan accordingly. Finish Drop Bag retrieval will be available near the Finish Line/Ultra Lounge for runners who wish to leave drop bags before the race with plans to collect them once finished. All other drop bags will be delivered to the upper parking lot at the Spooner Lake State Park, except Stonehenge drop bags will be left at Stonehenge. Pacers are allowed solely as a safety consideration for fatigued runners in the remote and rugged back country areas of the Tahoe Rim Trail Endurance Runs. Absolutely no physical or mechanical aid may be given by the pacer to assist the runner over difficult sections of the trail (except in medical emergencies), and no food, fluids or supplies of any kind may be carried for the runner (no muling). 100-Mile pacers are allowed beginning at Stonehenge 50-mile aid station (near the start/finish line) and at the second Diamond Peak aid station visit (80-miles). Both aid stations are accessible by car. Runners may only have one safety runner at a time. Tunnel Creek does not have vehicle access. Aid station personnel will make no arrangements to transport pacers or crew. No competitor who is not actually taking part in the competition shall accompany any competitor during the competition nor shall any competitor be permitted to receive aid or refreshment from anyone during the progress of the competition except within 100 meters on either side of the fully stocked aid stations. Pacers must check in at the 50 Mile aid station or at Diamond Peak aid station and will be issued a pacer bib number. This will help us make sure they are readily identifiable by our aid station staff, make sure we have enough food and beverage on the course for everyone and account for their safety in the same manner as our registered runners. Pacers should be self-sufficient, as they do not pay an entry fee. All pacers are required to sign an event waiver. Looking for a PACER? Or want to PACE a RUNNER? We have a new place for you to connect! Check out our PACER FORUM page. There will be First Aid / CPR qualified individuals and radio and /or cell phone communications at each aid station. There will be medical staff at key aid stations and at the start/finish. Safety patrol personnel will be deployed within each division between aid stations. The Tahoe Rim Trail 100 mile Endurance Run takes place on high elevation alpine and sub-alpine forest trails and dirt roads in the Carson Spur of the Sierra Nevada Mountains. The event is located on the northeast side of Lake Tahoe. All distances begin and end at the Spooner Lake State Park, which is at 7,000 feet. The highest point of the event is just below the 9,214 foot Snow Valley Peak (which also provides one of the best views on the course). The low point is at the bottom of the now “infamous” Red House Loop (A Taste of Hell) at approximately 6800 feet. Upon reaching Marlette Lake (7823 feet) veer right and continue to climb on dirt roads, connecting onto the Tahoe Rim Trail. About a ½ mile further you will come to the Hobart A/S at 8120 feet and 6 miles into the race. (At this point in the race, trekking poles are allowed). Get ready for a trail running party at this aid station. Famous for great food, smoothies and a walk up bar. After leaving the Hobart A/S the Tahoe Rim Trail climbs past Marlette Peak (Photo Opp) and Harlan Peak before descending on an awesome single track to the Tunnel Creek A/S 11 miles into the race. Tunnel Creek A/S will be your home base during this race. As a 100 mile runner you will come to this aid station 6 times. It is a perfect place for a drop bag for your night time clothing, headlamps and extra hydration sources. This is a huge aid station with an amazing array of food choices, a medical staff and medical tent. Upon returning to the Tunnel Creek A/S the 50M/100M course will travel approximately 6-miles north along single track section of the Tahoe Rim Trail. This section is mostly rolling with breath-taking views of both Lake Tahoe and Washoe Valley. The Bull Wheel A/S is a small water stop 3 miles from Tunnel Creek. DO NOT LEAVE THIS AID STATION WITHOUT A FULL HYDRATION PACK OR BOTTLES! You have about 8 miles before arriving at the Diamond Peak A/S. Many runners run out of fluids on this section. **I highly recommend using at least three hand bottles or a full hydration pack for this section of the course. At the Incline Creek trail junction the course makes a sharp left turn and drops down towards Incline Village, offering spectacular views of the North Shore of Lake Tahoe. This section of the course will provide views of Lake Tahoe not many but locals have seen. The Incline Creek trail will plunge down the mountain for approximately four miles and a loss of 2,000 feet of elevation, following the creek with many dives including twists and turns. As the trail flattens out towards the bottom you will come into the Tyrolean Village area directly behind homes. 100 Milers on your second pass in the middle of the night or early in the morning please be respectful of the residents there and keep the chatter to a minimum until you clear this area. Once you come to the Diamond Peak Lodge parking lot area, proceed to the lodge where the aid station will be. This is the Diamond Peak A/S for 30 mile (4:30 pm cut-off) and 80 mile (9:00 am cut-off). Again, a great aid station with many food options, indoor bathrooms, a place to warm up at night and the only spot to meet your crew. This A/S has medical staff available. It is imperative that your crew members only park in designated parking spots and not clog the roadway. During the event the race is accountable for keeping the roadway accessible by residents of Tyrolean Village and the Fire Department! Crews that do not adhere to this will result in their runner being DQ’d from the race. Yes, it’s that important! From there the course will follow the dirt service road up the ski run and onto the Crystal Ridge ski run, then up and over the top of Diamond Peak resort at 8540 ft for a 1700 foot climb in just under 2 miles. This climb is steep! Take your time, it will not make or break your race. Stop and catch your breath and turn around for the most spectacular view of Lake Tahoe you will see on the entire course. When you reach the top of the ski lift (bull wheel), a sharp right hand turn will drop you down to the Bull Wheel A/S (water and typical aid station fair only. No hot food and no ice) turn right onto the Tahoe Rim Trail. The course then returns to the Tunnel Creek A/S 3 miles south for the third time. Leaving the Snow Valley Peak A/S you will continue along the Tahoe Rim Trail about 5.5 miles before reaching the Spooner Summit Trailhead A/S. This part of the course winds around many turns but there is nowhere to get off the trail, just keep descending for what will seem like a very long way. The Spooner Summit Trailhead A/S is manned by a Cub Scout troop and is a water and electrolite fluids stop only. You sweep around a corner at the aid station connecting with the Spooner Lake trail for the final 1.7 miles to the Stonehenge-50 Mile A/S along a beautiful aspen grove and the shores of Spooner Lake. Upon leaving the single track trail and popping onto a dirt road you will make a left turn up a short hill to the Stonehenge-50 Mile A/S (10:00 pm hard cut-off). This is where many of you will have crew or drop bags and supplies to prepare you for your night time journey. This A/S has medical staff available. Upon leaving this aid station you will continue down a dirt path leading you back onto North Canyon road. The second 50 miles is the exact same course as you just completed but I guarantee it will feel different the second time around. Keep in mind this course averages about 8,000 feet of elevation. It will get cold at night no matter how warm it gets during the day. Also the air is very dry, normally less than 10% humidity. Follow the best guidelines from the Medicine and Science and Ultra-Endurance Sports group and drink to thirst. Also make sure to have layers to ward off the cold at night. The night time is when these aid stations come alive. You will be amazed at the food they will have for you and the level of support you will find. Remember there are no areas for crew to take care of you. You must to rely on these amazing aid stations. Qualifying standards apply to all ages, 18 years of age and older. Standards apply to trail races only. All individuals registering for the 100-Mile event MUST meet the “Qualification Standards” BY THE CLOSE OF REGISTRATION FOR THE LOTTERY AT 6:00 am for the 2019 event. The RD has extended official race/time completion to April 30th, 2019 for the 2019 TRTER Event. Runners without a qualifying race by April 30, 2019 will be dropped to the 50 Mile race without a refund. Registration officials will confirm that Qualification Standards were fulfilled by verifying the qualification information provided during the registration process. 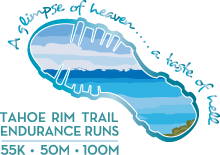 (If an individual registers for the Tahoe Rim Trail 100-Mile Endurance Run but proof of qualification cannot be confirmed the individual WILL NOT be allowed to participate. Refunds WILL NOT be issued). If you have completed a qualifying event but the results have not been posted at the time of registration contact the event’s Race Director. The Race Director reserves the right to determine if a race not covered above is a qualifying event. Eight (8) hours of volunteer work is required for each 100-mile participant prior to the event. These hours must be accrued while performing trail construction or maintenance (preferably, but not necessarily, on the Tahoe Rim Trail). The volunteer service must be performed between July 1, 2018 and July 8, 2019. All completed Volunteer Forms must be submitted to George Ruiz no later than 6:00 pm, July 8th, 2019. If forms are not received by the deadline, 100 Mile entrants will be moved to the 50 Mile event without a refund. IMPORTANT NOTE: It is the responsibility of the registered runner to assure the Volunteer Requirements are completed and submitted in a timely manner. Race Registration staff WILL NOT send reminder notices.